One marine scientist calls Whale Cove, south of Depoe Bay, “the only virgin cove in Oregon.” After an attempted housing development on the land above Whale Cove failed in 2005, NCLC began working with representatives from Oregon State Parks, state and federal highway agencies, the US Fish and Wildlife Service, and Whale Cove-area homeowners to explore ways to protect this special stretch of sea cliffs and coastal forest. One of those homeowners—the Bryce Buchanan family—stepped in, bought the property, and began working with NCLC to design a conservation acquisition plan. The property was valued at $2.25 million; the Buchanans took $1.1 million for it, in effect making a $1.15 million donation to conserve the land. “Seldom do you find a citizen like Bryce who not only intentionally buys land for the purpose of conservation, but then has the patience and fortitude to work for more than a decade with multiple government agencies to achieve the goal of preservation,” said NCLC director emeritus Neal Maine. In addition to negotiating a deal with the Buchanans, North Coast Land Conservancy secured $450,000 in funding from Oregon State Parks and $650,000 in federal scenic byway funding. Finally on Dec. 14, 2014, 14 acres surrounding Whale Cove—nearly all the land fronting the cove—became part of Oregon Islands National Wildlife Refuge. The US Fish and Wildlife Service agreed to take ownership of the property and manage the site in perpetuity for its habitat value. 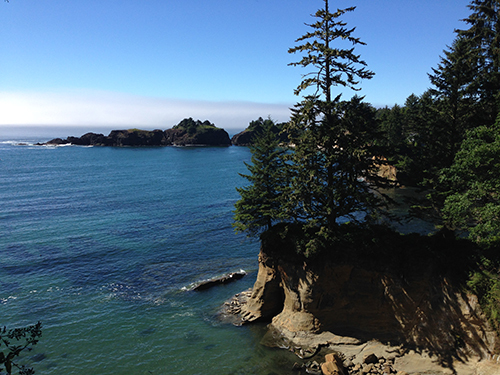 There is no public access into the cove, but you can see it from adjacent Rocky Creek State Scenic Viewpoint.